After completing a full marathon and half marathon in January, and then a half marathon, 10k, and 5k, in February all while having severe ITBS and Tendonitis (along with greater trochanter pain), I decided that I was going to rest the entire month of March. I continued my stretches and rode the bike a few times (although not as much as I should have). As you can tell from the blog, I did some updating (and some things you probably can't tell from looking at the blog are all the photos that I re-sized to help the pages load faster). All this work took a LOT of time. Add this to some work projects that I've been doing and that means a LOT of time being on a computer. April is going to be my time to Log Off, Shut Down, and Go Run! Tomorrow is the last day to submit miles for the Rock n Roll Las Vegas Virtual run, so I plan to do that. If you haven't done that yet, get on it. You get some cool swag! 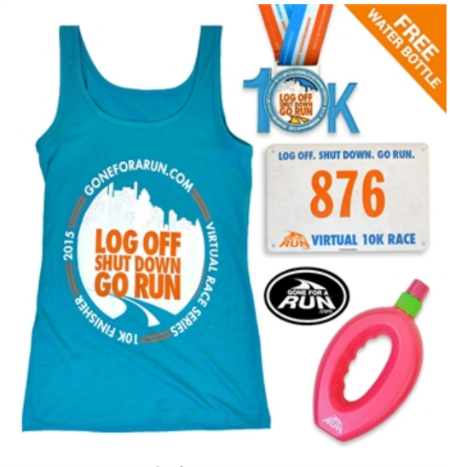 Also, Lacey and I have been invited to do the Log Off Shut Down Go Run Virtual 10K race with Gone For A Run! Who wants to run that with us? The race will take place April 24-26. Since it is Virtual, you can run it anywhere of course. 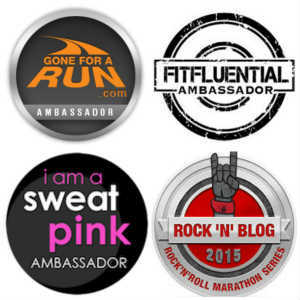 Your registration Fee will include a race tank or tee, a bib, a finishers medal, and a cool car magnet. After you completed the race, post on social media for your chance to win more great prizes from Gone For A Run. Interested? For more info check it out at HERE. 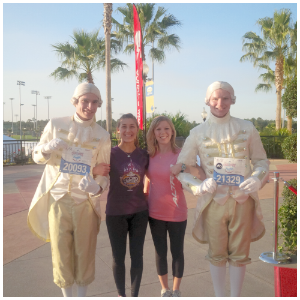 I figure this will motivate me to get some more miles in before the Tinkerbell half Marathon in May! Since I'm building slowly this spring, I really like the concept of virtual races. I may not be ready to do a 5k comfortably before it gets too hot, but I can do the distance inside. Glad you were able to take that time off in March to run. I've been doing a lot of tweaks to my blog to make things better too...it can be a lot of work! The virtual race sounds cool! Hope next month is a bright one for you as you return to running. It is hard to not be able to do something you love. I have done a couple virtual runs, but none for a while. May have to check them out again! I enjoy virtual races as some extra motivation too. Thanks for mentioning the Rock and Roll Vegas one, I didn't realize they were doing that one again. i just did my first virtual run for the jeff galloway 13.1 and really liked it. I signed up for a new one in the Spring and Fall-the Nerdy Hallows which is 3 races and then you get medals for all of them! I've never done a virtual race, but they seem to be so popular lately! It's cool that you get gear and prizes with it, but I think I'd prefer an actual race where I can push my pace and be motivated by others. I don't have the discipline to race alone! That's a really cute medal for the virtual race - I am tempted! I have used a virtual event as motivation to pick up the speed a bit lol since i am posting my time :) The changes to your page look great! I have done a few virtual races, for me, I like doing it for charity, etc but it never feels like a race to me, more just a training run, I need the motivation of a lot of others around me but good luck and have fun!! I totally need to do my 5km for the Vegas virtual run. I have ran but forget to record it and send it in. I'm glad I still have one more day. I hope your ITBS and Tendonitis is doing a lot better! Thank you. I can't wait to get out there and run pain free. I hope that's sooner than later. Woo hoo for getting back out there! I hope you get a bunch of pain free miles done and that you love every moment! Thanks for linking up with us today! Here's to a great April! I've never done a virtual race. Eek! Cool opportunity. I usually don't pay for virtual runs though since I always run on my own for free. Your blog looks nice! That virtual race sounds great! I may have to check it out. I'm all for logging off and shutting down and could definitely use more running! I am so sorry to hear that you are STILL plagued by these injuries Meranda. Will we see you on-line at all in April? (I sure would miss you.) Slow and steady wins kid! I like virtual runs and I think they make great training runs- love it when I can find a virtual 10K! this is the same weekend that I am running the half in Nashville! How is it I didn't not know you had tendonitis? I knew about the IT band issues, but somehow I missed that. I hope this month helped, really fingers crossed hope that it was exactly what was needed!